Click on the link for more, and larger, images. 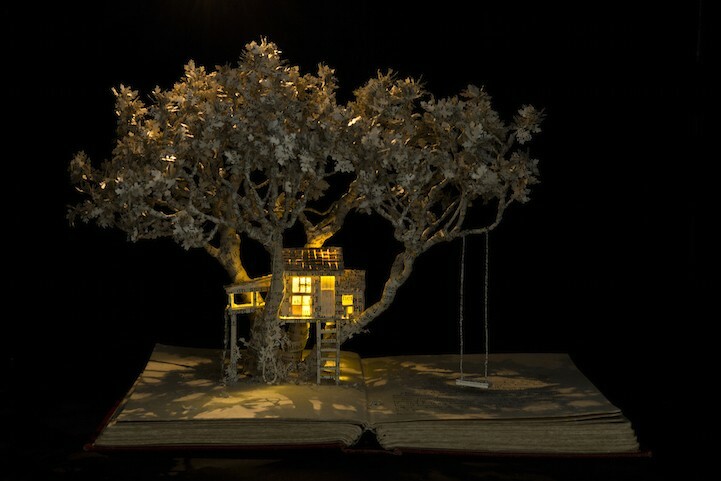 These are beautiful and fascinating – as if the books are birthing dreamscape worlds made of paper, ink and words (which is, of course, what books do….). This entry was posted in beauty, creativity, metaphor & dream, wonder and tagged affordable counselling exeter, book sculptures, counselling exeter, counsellor Exeter, counsellors Exeter, dream, dreamscapes, illuminated book sculptures, low cost counselling exeter, metaphor, Palace Gate Counselling Service, Palace Gate Counselling Service Exeter, person centred counselling exeter, story-telling, storytelling, Su Blackwell, www.earthables.com, www.palacegatecounselling.org.uk. Bookmark the permalink.